The U.S. economy grew at a slightly slower pace than originally reported in the first quarter, according to revisions released by the Commerce Department on Thursday. The revisions show that gross domestic product -- the broadest measure of economic activity -- rose at a 2.4% annual pace in the first three months of the year, down slightly from the 2.5% pace originally reported last month. It's typical for the Commerce Department to revise the data several times, and Thursday's report marks the second of the agency's three scheduled GDP estimates. The report didn't significantly alter the picture of the U.S. economy. We know from the GDP report, as well as other government data, that consumer spending picked up in the first quarter, but job growth continued at roughly the same pace as in the fourth quarter of 2012. "Today's report isn't likely to move the needle, as it contained no real surprises," said Jim Baird, partner and chief investment officer for Plante Moran Financial Advisors. Consumer spending, which accounts for roughly two thirds of the GDP measure, rose at a 3.4% annualized pace in the first quarter. Overall, that was the fastest pick-up in consumer spending since the fourth quarter of 2010. That growth was slightly impressive, since it coincided with lower take-home pay for most Americans, following the expiration of the payroll tax cut. On the other hand, economists also point to temporary factors at play. Utilities alone accounted for about a quarter of the pick-up in consumer spending. March was also the coldest March since 2002 -- a factor that also boosted spending on heating. Spending on financial services and health care, as well as strong auto sales, were also bright spots. On the business side, spending on software and equipment boosted growth. Meanwhile, businesses restocked their shelves and warehouses after drawing down their inventories in the fourth quarter. That, too, is likely to be a temporary factor. Cuts in government spending were the single biggest drag on economic growth. 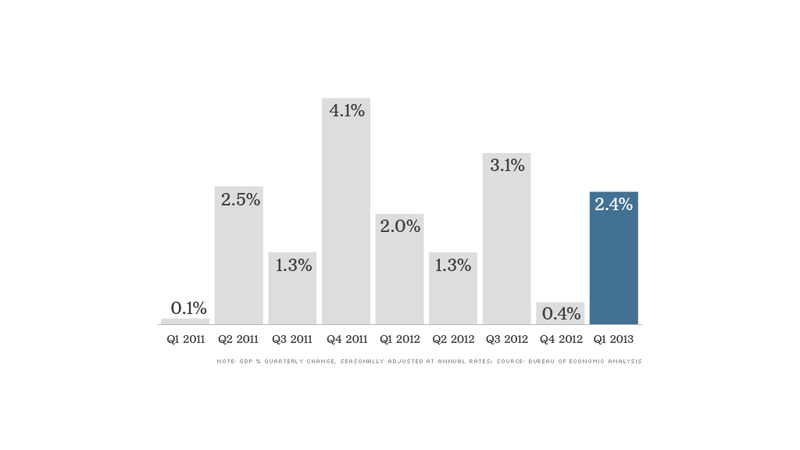 Without government cuts at play, the economy would have expanded at roughly a 3.4% pace.